At the end of December last year, we abandonded ADAGIO to the Pacific Northwest winter, and flew to Hobart, Tasmania, Australia, for three months of festivals, boat shows, music, good friends and outdoor adventures. When we arrived, the Hobart summer festival was in full swing for the month of January, followed by the “Taste of Tasmania“, the Cygnet Folk Festival and the Hobart Comedy Festival. Being boat-less, we took the opportunity to explore by car and by tour boat. Most fortunately, our mate Adrian took us sailing aboard CAMIRA, and also for a tour by auto of lovely South Bruny Island. The weather was stormy and dramatic, which suited the photographers in the group. Dramatic skies, miles of beaches and rocky shores, southern hemisphere rain forests and albino wallabies. We toured the dramatic rock formations along the seashores of the Tasman Peninsula, by a tour boat operated by “Sealife Experience“. The naturalist told us about the white bellied sea eagles that we saw nesting in the trees, fairy penguins in the water near the boat, seals and cormorants on the rocks and in the water. But the most interesting features were the geology of the shoreline. We were in an area where sedimentary layers meet volcanic dolerite. To paraphrase from Wikipedia: Volcanism, associated with the Jurassic breakup of Gondwanaland in the Southern Hemisphere caused the formation of many large diabase/dolerite sills and dike swarms. Tasmania has the world’s largest areas of dolerite, with many distinctive mountains and cliffs formed from this rock type. Locals have given these landforms names including the words, “pillars”, “needles” and “organ pipes”. The tour boat took us close to the rock face, and into caves, much more intimate with the shoreline than we would ever come with ADAGIO. When we returned to Bainbridge Island, Washington, in April, spring was in the air, the icy docks were dry and warm, and the weather was perfect for bicycling. We followed our favorite shoreline routes several times a week, alternating days with working out at the gym. We enjoyed watching David sail his Optimist dinghy at Port Madison, and Dorothy even volunteered to help man the “bock” one day of sailing camp. Steve bought David a radio controlled airplane, then got hooked himself. Every Friday evening we met other RC flyers at Battlepoint Park for a fly-in. The guys learned to fly the planes, we all learned how to poke a plane from below to disentangle it from a tree, and the guys learned about fast-drying epoxy and tape for repairs. In July we visited with family, and Dorothy joined the wedding party for our niece, Elizabeth, at the historic and elegant Stanley Hotel in Estes Park, Colorado, the gateway to Rocky Mountain National Park. August brought our daughter’s birthday celebration. And then we were ready to depart for cruising in British Columbia waters. Our first stop was Victoria, where we enjoyed the Victoria Splash! symphony performance on the inner harbor, the Dragon Boat Races and dance performances, the Canadian Air force Snowbirds air show, and the Victoria Wooden Boat Festival. When the winds turned from northerly to southerly, we sailed north to Nanaimo. This was a safe place to leave ADAGIO for a land tour to the west coast of Vancouver Island, and The Pacific Rim National Park Reserve. Rain coast forest walks, miles of sand beaches full of surfers on a summer’s day, elegant dining, and an amazing boat tour to watch black bears turn over rocks on the beach and lap up pools of tiny crabs. As fairly new members of the Ocean Cruising Club, we had signed up to join other members for a Rally cruise with 19 other boats in Desolation Sound, British Columbia. We had met our first OCC members in New Zealand, about 10 years ago. We were very warmly greeted by the Rally organizers, Lisa and Andy, at Cortez Bay. A grand BBQ brought the 70 cruisers together for the first time, and we made friends immediately. Several of the members were friends of other cruising friends, and we were happy to finally meet them in person. Mostly circumnavigators, we felt as if we were surrounded by giants, who were down-to-earth, and looking for a fun time together. Each day we sailed to a different island, cove or inlet, and occasionally hiked to a freshwater lake for a swim. The weather was exceptionally fine. Most nights we formed a large raft of boats, with boats being berthed side-by-side, and every fourth boat setting an anchor and taking a stern line ashore. The logistics of this complicated operation were handled with great skill by Lisa and Andy. One night ADAGIO was selected to be the center boat in the raft, and the “party” boat for the evening. The Barrel of Monkeys choral group had been practicing for days, and they selected the bow of ADAGIO for their performance stage. All 76 OCC members climbed aboard, with drinks and nibbles in hand, to enjoy the show, increasing the depth to which ADAGIO settled into the water by a fair amount. We were pleased that people did not start dancing, and the evening was a big success. One late afternoon, after forming the raft along the shore, our organizers led us out into the center of the channel for a dinghy raft-up in the sunshine, with everyone bringing drinks and sharing appetizers, singing, telling stories and spinning the super-raft around in great circles. We agreed that we were probably having more fun than we would allow our children to have. We made many new friends and hope to join an OCC rally again in the future, with or without ADAGIO. Half of the members attending this year’s rally had chartered their boats in Canada. The other half arrived aboard their own boats. After the rally, we sailed south to join our friends Ralph and Nan at anchor in Montague Harbour in the Gulf Islands. Ralph led us along the beach and forest trails around the park ashore, and we found more photography opportunities. Back in Victoria, we toured and dined and visited with our new OCC Canadian friends. Rose and David took us to beautiful places we had never seen during our many visits to Victoria. We shared meals with Tony and Coryn Gooch and Shaun and Penny, as well as the intrepid single-handed circumnavigator Jeanne Socrates. Hanging flower baskets were being removed from the gardens surrounding Victoria Harbour. Rain clouds appeared more frequently, and we began to plan for our passage south to San Francisco. Our wonderful friend, Joe Siudzinski of KatieKat, joined us aboard ADAGIO for the passage south. After a long wait, we found a solid weather window that would allow us to make our way safely the 60 nautical miles west through the Strait of Juan de Fuca, and that also would allow us to round Cape Mendocino in California in safe seas and winds. When the decision was made, we sailed across the Strait, and entered the US in Port Angeles. The next day we sailed to Neah Bay to wait for an early morning departure. We safely negotiated the icy docks as we released our dock lines. As we sailed south down the coast of Washington, an enormous Mt. Olympus raised his snowy peaks. To avoid crab pot floats, logs and large ships and fishing boats, we headed offshore before turning south. We had a boisterious, non-stop four and 1/2 days passage, with only the communications gear giving us problems. We had sailed and raced our own boats on San Francisco Bay when we lived in Tiburon for 12 years, but never aboard ADAGIO. The winds abated and the sun filled the skies as we passed under the Golden Gate Bridge. Fortunarely, we had Joe handy to snap our photo. Since arriving in the Bay Area, we have spent many (but not enough) days with our daughter and her family who have moved to Menlo Park. We will share Christmas with them, then fly to Hobart where we are looking forward to more festivals, Australia’s best Wooden Boat Festival, and the Ten Days on the Island Festival. At our website, there are lots of photo galleries and earlier dispatches. Dorothy and I continue beavering away in our efforts to catch up with Adagio Journal photos. As we organize our blog posts by the real-world dates, you will need to scroll down through the blog posts back to Sept 4th, 2008 to see the “latest” posted this week. Alternatively, you can use one of the many photo-finding tools in our photo galleries — specifically “Photos by Date”, then select the “Show by: date uploaded” instead of the usual “…date taken”. 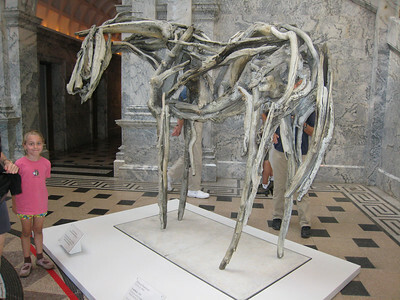 E.g., click here to display all the new pics we’ve uploaded in November. That generates a big page of 302 thumbnails uploaded since we landed in Alameda. The Weindorf family bicycled from their home in Menlo Park to the Stanford Campus. Elizabeth and Miguel Vieira and Steve and I drove, and met them at the Rodin Sculpture Garden next door to the Cantor Center for Visual Arts. This is the third largest Rodin collection in the world. We toured the Leland Stanford, Jr. memorabilia collection in the museum, then enjoyed a fine lunch in the museum cafe. It was too fine a day to stay indoors, so by bicycle and on foot, we followed the campus sculpture trail. When we reached the Hoover Tower, we took the elevator to the viewing platform 250 feet from ground level. The views were beautiful, and the carillon in the tower was an added bonus. “Hoover Tower is part of the Hoover Institution on War, Revolution and Peace, a Stanford-affiliated public policy research center founded by Herbert Hoover, a member of the university’s pioneer class of 1895 and the 31st president of the United States.” “At the top of the tower, visitors can see a carillon of 48 bells cast in Tournai, Belgium, a gift of the Belgian-American Education Foundation. The largest bell is inscribed, “For Peace Alone Do I Ring.” (from the Stanford web site). Another highlight was the Stanford Memorial Church, which is covered in exquisite mosaics, inside and out. It was built by Jane Stanford as a memorial to her husband, Leland Stanford. Fortunately, the church was renovated after extensive destruction by the earthquakes in 1906 and 1989. After we picked David up at his soccer game, he took us on a tour of the amazing murals that have painted on the walls of his school by the students. 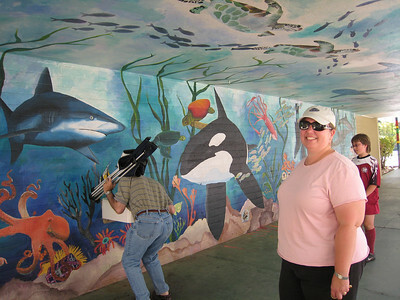 Guided by an art teacher, each year the Hillview School students create a new mural. The themes are varied, and they all look very realistic. 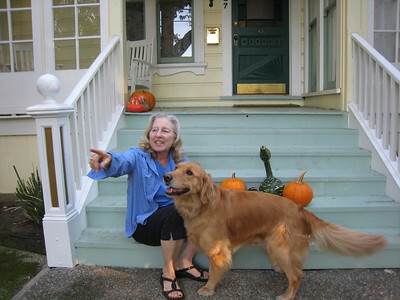 ‘Twas a week before Halloween, and all through the house, not a creature was stirring, not even a guinea pig (because the guinea pig was out on the front porch steps with the pumpkins and dog (and grandma)). The bicycles were stored in the back shed with care, in hopes that their riders soon would be there. When out on the back driveway there arose such a clatter, we sprang from our seats to see what was the matter. Away to the driveway I flew like a flash, carrying my camera, I came in a dash. The sun shining down on the new fallen leaves gave a golden sheen of autumn to objects and eaves. When what to my wondering eyes did appear, but a bevy of bikes and four riders, too. They swirled in the drive, blurring sight with their speed, as they warmed up for their trip to Stanford campus and feed. And I knew in my heart that I had to follow, so we piled in the car (our bicycles were needing parts and conditioning) and the next post will tell you what we had to swallow. Happy Halloween to all, and to all a good bike. 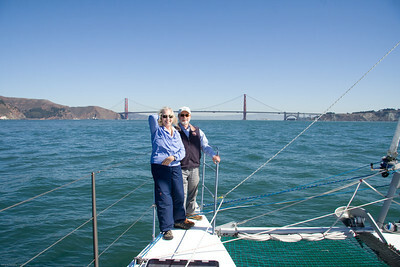 After some fifteen years in the South Pacific, Australia and New Zealand, Adagio is in San Francisco Bay for a while. Of course one of the very first things we were keen to do was to organize a sail on the Bay! We found typical Indian Summer conditions on the Bay: sunny and windless on the way to the Bay Bridge from Alameda. Then light fog and 10-15kn crossing the Bay to Angel Island. “Bikini weather” in the lee of Angel Island. Light headwinds and LOTS of foul current as we tacked back and forth westbound in Raccoon Strait — which offered multiple opportunities to take some photos of our former Tiburon neighborhood around Tower Point Lane. We sailed over to Richardson Bay hoping for a glimpse of Maltese Falcon — no luck there. We decided it was too foggy and cold to sail upwind under the Gate. So we fell off for a fast reach in 15-20kn back across to the City Front — where we got a brief glimpse of the magnificent Maltese Falcon berthed near Pier 39. 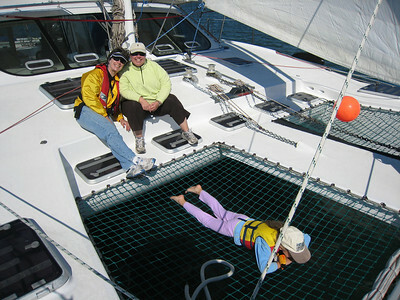 Our guests seemed very happy to be able to relax in the warmth of Adagio’s cockpit and saloon — well-sheltered from the wind, fog and occasional spray. Oct. 10-14: Just before dawn we found ice on the decks in Neah Bay — is that a hint we need to be sailing south? We took the hint, departing with windless, blue skies and eight foot swells out of the northwest. After motoring for ten hours, we were able to set full main and jib, sailing comfortably at 165 degrees true wind angle. The Olympic Mountains displayed their craggy, snowy western side all day, and black shearwaters circled the boat. A gibbous moon rose off our port bow after an orange sunset had entertained us to starboard. The true wind speed increased to 21 knots, and we sped along at 7 to 9 knots. Our only problem was that we were unable to send out messages over either Sailmail or Inmarsat-C. Since pre-passage testing in Victoria showed both were working fine we had not activated our Iridium satphone. So for the first time on ADAGIO we were down to just short range VHF communications. So Rick Shema and our daughter were wondering what happened to our usual daily position reports. During the night, numerous ships and fishing boats appeared on our radar, and on Joe’s AIS system. On Saturday, the wind dropped to about 10 knots, but we maintained our speed of 7 to 8 knots, under blue skies. We were unable to celebrate Joe’s Sunday birthday with a real cake, due to the sea state, and at 1700 hours, we put 2 reefs in the mainsail. On Monday morning the 13th, at 0200 hours, Joe was at the helm when ADAGIO surfed to 18.8 knots in winds gusting to 29 knots true. Joe thought it was a fun birthday present. But continuing to take it easy and sail conservatively, we put the fourth reef into the mainsail and the boat settled down. Then shortly after Dorothy came on watch at 0300 auto pilot #2 decided to take a holiday. Fortunately we designed ADAGIO with two completely parallel B&G Hydra pilots — so we flipped the pilot selector switch to pilot #1, and quickly regained our course. As we rounded Cape Mendocino, the true wind speed dropped from 20 to 17 knots, and we hoisted the mainsail to the first reef. Dolphins joined us, and played in our bow waves for 30 minutes. We were finally able to send a couple of position reports out via Sailmail over HF email. During the night watches ADAGIO was surfing to 10 to 12 knots in 17 to 20 knots of breeze, and four meter seas. Between surfing, the boat speed averaged 8 to 11 knots. On Tuesday, I phoned our daughter as we came into cell phone range north of Point Reyes. We were surprised to hear that she had notified the Coast Guard after not receiving a position report for 48 hrs. The CG contacted Jim Corenman, who checked our Sailmail activity and told the CG that it appeared to be a communications problem. Steve had spent many hours trying to send position reports through Sailmail and Inmarsat-C, so it was clear we had some trouble-shooting to do in San Francisco. Four days + five hours from Neah Bay we were fortunate to be sailing under the Golden Gate Bridge on a lovely, fog-free morning — and this was ADAGIO’s first time to sail under the “Gate”. We had been away for fourteen years, so we looked forward to seeing all our San Francisco friends again.